The tutorial was on Thursday March 24th, although towards the end of the conference it gathered quite a full room. As it is difficult to even define what access/metro convergence is I think more than a tutorial it was an opinion on the topic, but it was well accepted by the public. This is the link to the slides. Enjoy! Through the DISCUS FP7 project David Payne and I have recently published two white papers. I have been invited to give the Keynote talk on the Monday evening at the IEEE Consumer Communications & Networking Conference, in Las Vegas on January 11th, 2016. I’ll be talking about Access-Metro convergence in future broadband networks. Thanks again to the conference chairs for the invitation. A €1 million telecoms research project, O’SHARE (www.oshare.ie), has been launched at the CONNECT Centre in Trinity College Dublin. Led by Dr Marco Ruffini, Assistant Professor in Optical Network Architectures, the four-year project will explore ways of improving the capacity of optical networks to cope with the surges in demand typically experienced at large gatherings such as concerts and sporting events. “O’SHARE is ultimately about sharing network resources to deliver better results for users,” according to Dr Ruffini. “Take the Electric Picnic, for example, when up to 50,000 people gather in a field in County Laois. The cellular network suddenly experiences a surge in demand – up to a thousand times more than usual. The available capacity reduces dramatically and accessing Facebook or sharing a video on a mobile device becomes very frustrating. “All mobile-phone masts are connected to a fibre-optic backhaul network. This backhaul network will be the focus of O’SHARE’s work as we explore ways of dynamically allocating resources to areas of poor connectivity. “We will also focus on multi-tenancy which allows several service providers to operate the optical access networks at the same time. This would also lead to greater competition in the market, resulting in cheaper data plans for users. Dr Ruffini is a native of Ancona in Italy. He completed his undergraduate degree in Marche Polytechnic University in 2002. He then worked with Philips R&D, before completing his doctorate degree in Trinity College. He is currently coordinating a large-scale EU project on future optical broadband networks known as DISCUS which brings together key players in the optical field from around Europe. A new linkeding group Boradband Ireland was created to put in contact people that work or have a strong interest in the development of broadband in Ireland. The group focuses on discussion topics spanning the following areas of interest: technological, economic, regulatory, and of course on aspects of rural deployment.. but it is open to wider contributions. Please join if you are interested.. The position is as postdoctoral researcher at CTVR, University of Dublin, Trinity College. The are is FPGA platform development for PON protocols. Within the DISCUS project, we have recently released two new white papers on: “Business and ownership models for future broadband networks” and “Wavelength usage options in access networks”. The main scope is to stimulate a wider debate on such topics, so you are very welcome to contact us with any comments you might have. We list a number of possible scenarios for next generation multi-wavelength optical access networks (i.e., FTTH), and express our opinion, as a consortium, in the matter. We consider technical issues as well as economic, regulatory environments and ownership possibilities. Ownership, usage and regulation in next generation fibre access network: can we move away from competition at the physical layer? Unbundling of access networks has, over the past two decades, introduced competition into the phone and broadband market, favouring a global decrease in prices and large increase in Internet usage. This has pushed many businesses towards a new and profitable web-based economy, which has lead to the development of new services and applications, that have progressively required larger and larger network capacity. As such increases in capacity requirements pushes the old copper access network beyond its physical limits, new fibre-based access networks are being deployed all-over the world. However the deployment of fibre infrastructure in the access network has created significant concerns for the national regulators, as it was not clear whether the same copper unbundling rules should apply also to fibre. On the one hand operators seek assurance of a stable and favourable regulatory environment to assure adequate revenues from the potentially high-risk investment, of deploying extensive new fibre infrastructure. On the other hand regulators don’t want to create a new monopoly, by allowing large institutions to roll out and unconditionally own their fibre infrastructure. A number of solutions have been proposed to this issue in different world regions, with different outcomes. In Europe, the initial hesitation to move away from copper unbundling regulations, has made it one of the regions with the least fibre access installation in the developed world. The aim of the workshop is to discuss established practices, current trends, and novel, potentially disruptive solutions to network ownership, usage and regulations, bringing together opinions from a number of different telecommunications research institutions, including vendors, operators, national regulators and academia. – Sharing network infrastructure in next-generation single and multi-wavelength systems. – Ownership and usage in integrated wireless/optical access networks. The workshop will consist of a number of invited presentations, followed by a panel discussion with the audience. Date: Thursday April 9th, 1.30 p.m. Location: Trinity College Dublin, Lloyd Institute, lecture theatre LB01. The event will be recorded and streamed on line. – 13.30-13.40: Caoimhe Donnelly, Fergal Mulligan (Comreg) – Policies and initiatives regulating FTTC and FTTH. – 14.20-14.30: David Payne (TCD): Can we move away from physical layer competition? Here’s a piece on DISCUS, in la Stampa… All in Italian.. I am coordinating, together with David Payne a large European FP7 project called DISCUS. The project goal is to exploit demonstrated technology and concepts needed to define and develop a new radical architectural concept that can enable an integrated wireless and FTTP future network which addresses the economic, energy consumption, capacity scaling, evolutionary, regulatory and service demand challenges arising from an FTTP enabled future. 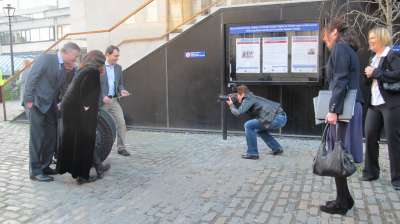 DISCUS launch event at Trinity College Dublin. 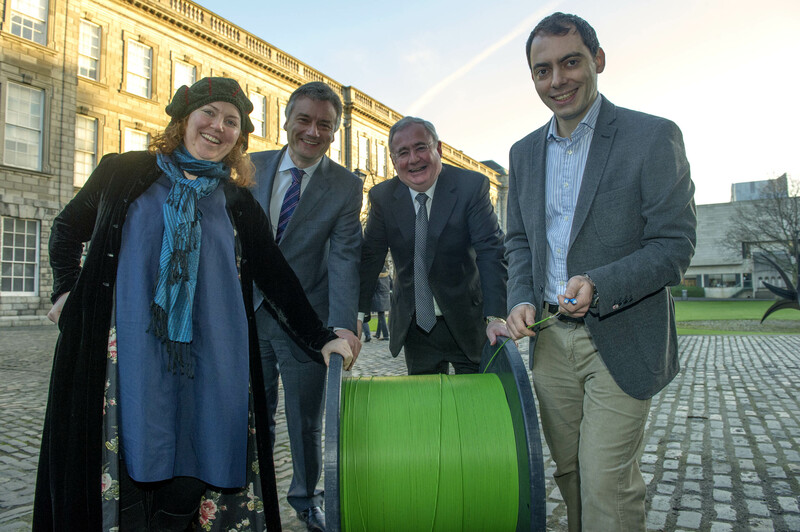 From left to right: Prof. Linda Doyle (CTVR Director), Prof. Patrick Prendergast (TCD Provost), Pat Rabbitte (Irish Minister for Communications, Energy and Natural Resources), Dr. Marco Ruffini (DISCUS Project Manager).